This Autumn I have two exhibitions happening at the Bristol Tobacco Factory snug and Bocabar at Paintworks. 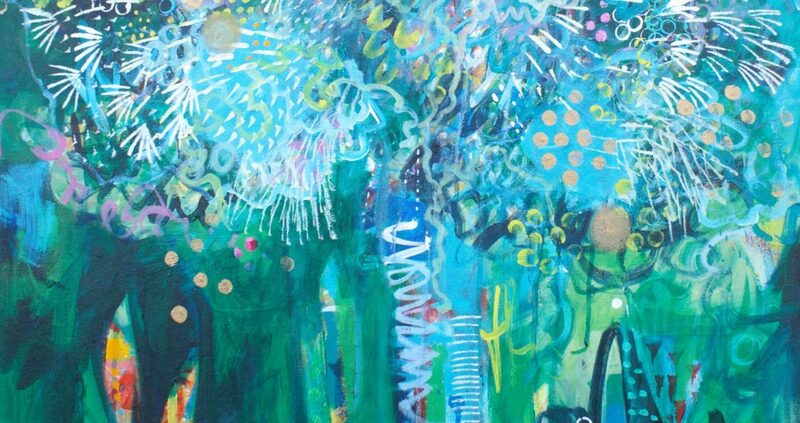 The Tobacco Factory show will feature a collection that explores intuitive journeys in paint and the Bocabar exhibition will be a riot of colourful fantastical flowers. An Intuitive Painters Journey at the Tobacco Factory Snug will reveal a new collection of abstract landscapes and travel memory paintings. Travel is a metaphor for the way I paint as well as being an inspiration for the imagery I am drawn towards. Each painting is as much a journey in process as the selected memories or imaginary responses that find their way onto my canvases. I aim to stay in a free place with my art. It is my choice and compulsion to choose an intuitive pathway guided only by curiosity. This is a liberating route to happiness, not clouded by rules but manifesting in joyful outpourings that celebrate colour and beauty in what is seen, imagined or remembered. Fantastical Flowers features a new collection of funky floral paintings celebrating the riotous colours of summer meadows. The paintings are imaginary and process driven. Pattern, decoration and motif are employed using acrylic layering to achieve depth and richness so that the paintings explode with colour contrasts.